Timothy Cardinal Dolan, archbishop of New York, discusses the Catholic call to faithful citizenship in this video produced by the United States Conference of Catholic Bishops, of which he serves as president. To read the U.S. Bishops’ statement “Forming Consciences for Faithful Citizenship, go HERE. This is the default one-video player that automatically it is used to show videos grabbed by users with the get code feature of one of our players. This may sound odd given the very public and profound disagreements we have had on some extraordinarily important issues, but our thanks were genuine nevertheless. Specifically, we thanked them for bringing a new era of competence and cooperation to Albany. We believe in giving credit where credit is due, and we applauded them for that. With that being said, it is our fervent hope that this spirit of bipartisan cooperation can extend to another critical issue for thousands of New York workers, and that is a modest increase in the state’s minimum wage. We are aware that there are many in the legislature who firmly believe such action would have a negative impact on the very people it seeks to help. Perhaps just as many believe the opposite is true. We don’t pretend to be economists, but we are pastors, and we do oversee the largest nongovernmental network of health, education and charitable ministries in the state. What we can tell you from first-hand experience is that it is becoming increasingly difficult for the working poor of our state to make ends meet. A full-time minimum-wage earner will bring in $15,080 per year, which is $4,010 below the 2012 federal poverty guidelines for a family of three. Our sustained recession and painfully slow recovery have left many of these workers – often people of color and frequently the newest immigrants to our shores who therefore have the fewest support systems – on the brink of homelessness, with not enough in their paychecks to pay for the most basic of necessities, like food, medicine or clothing for their children. The argument that minimum wage jobs go solely to high school students just entering the workforce does not hold true in the current economy, with the unemployment rate near 10 percent in New York City and 8.5 percent statewide. Workers who previously never would have considered such low-paying jobs are now taking them out of desperation. By no means do we question the intentions or motivations of our good friends in the legislature who oppose an increase in the minimum wage. But it is our hope and our prayer that the two sides could come together for some sort of action to address the grave problems facing the lowest wage earners in our state. We believe an increase in the minimum wage is a matter of fairness and justice, and we hope it can be addressed soon. And when that happens, we will be so happy to come once again to Albany to say personally, on behalf of those most poor and vulnerable New Yorkers, thank you. 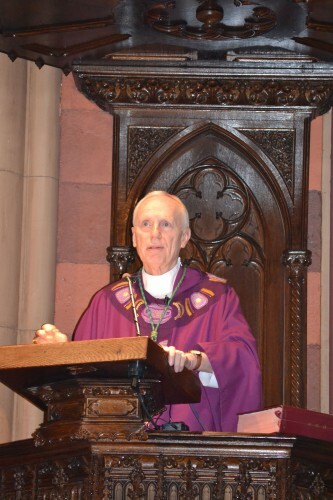 Bishop Howard J. Hubbard of Albany delivered the following homily at the March 13, 2012, Catholics at the Capitol Mass at the Cathedral of the Immaculate Conception in Albany. Cardinal Dolan recently stated that we are witnessing an unprecedented effort to reduce religion to a private activity, driving religious beliefs and traditions from public life. Never before, he said, have we faced this kind of challenge to our ability to engage in the public square as a people of faith. I would like to build upon the Cardinal’s assessment in this homily. The Diocese of Rockville Centre held a Public Policy Convocation March 3 in Hicksville in preparation for the March 13 Catholics at the Capitol Day sponsored by the New York State Catholic Conference in Albany. More than 700 Catholics attended the event and were treated to an excellent keynote address by Timothy Cardinal Dolan, archbishop of New York, on the intersection of Faith and Politics. The video below from Telecare includes an interview and insightful homily by Bishop William F. Murphy of Rockville Centre, as well as the Cardinal’s full address. As Cardinal Dolan said in his 2010 Catholics at the Capitol homily, religion and politics “go together as naturally as a hot dog and a bun.” The Hicksville address is inspiring and well worth watching. Advances in medical technologies bring with them new means of curing disease and living longer, healthier lives than ever before. But they can also be the source of heightened patient anxiety about a needlessly prolonged, painful and expensive dying process. Medical advances bring with them new and complex questions with regard to medical treatments and moral decision-making. A statement of gratitude from the Catholic Bishops of New York State to the faithful following the vigor with which so many faithful Catholic New Yorkers fought to preserve the true meaning of marriage as the state radically redefined it. New York’s Catholic Bishops say that the passage by the Legislature of a bill to alter radically and forever humanity’s historic understanding of marriage leaves us deeply disappointed and troubled. Good afternoon, Senator DeFrancisco, Senator Flanagan, Assemblyman Farrell, Assemblywoman Nolan and honorable members, my name is Timothy Dolan, Archbishop of New York. Joining me today is Dr. Timothy McNiff, Superintendent of Schools for the archdiocese, and Jim Cultrara, Director for Education at the NYS Catholic Conference, of which I am honored to serve as president. I am grateful for this opportunity to comment on Governor Andrew Cuomo’s budget proposals related to elementary and secondary education. It is my hope and prayer that my comments help you shape a state budget that is fair, just and prudent. I am honored to address distinguished public officials such as yourselves, and deeply appreciate your high interest in education. I am here on behalf of the approximately 200,000 students in the state of New York in our Catholic schools, (the largest non-governmental school system in our state), young people and their parents of every religion or none at all, of every ethnic and economic background. I am speaking for them. 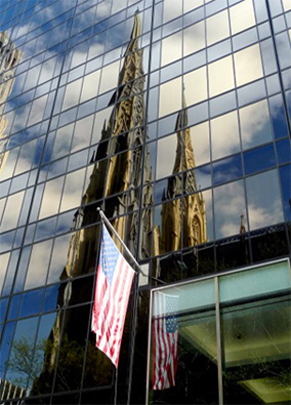 A statement from the Catholic Bishops of New York State on the need for Catholics to inform their conscience on the issues and vote in the upcoming election November 2. A statement by the Catholic Bishops of New York State on a legislative proposal to fundamentally change the institution of marriage.